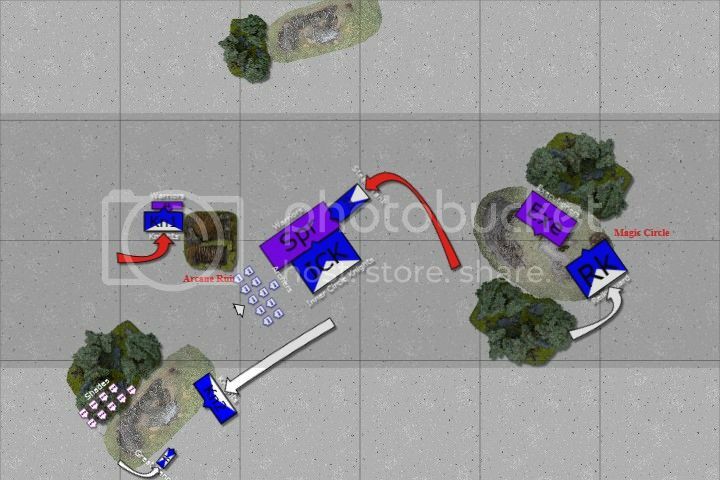 Tactical Decision Games are a fun way to think through tough situations that Empire Generals face. It is all about making tough decisions in tough situations… so the next time you face similar situations- you are ready for them! 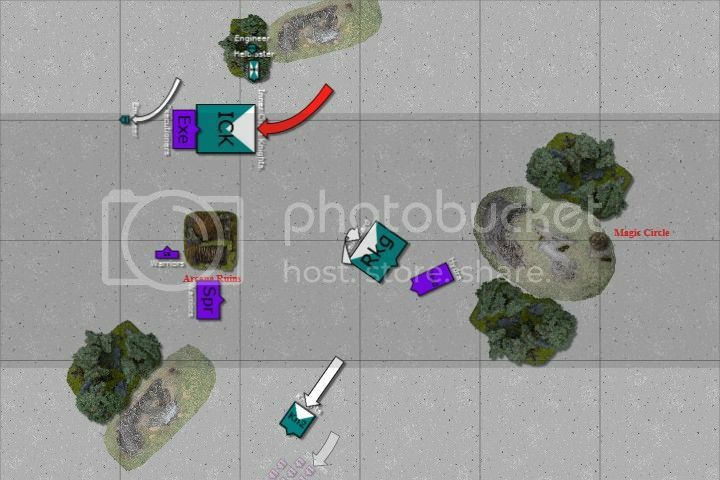 Check out Tactical Decision Game 1: Empire versus the Ogrebus if you haven’t seen it yet to get an idea of what a TDG is all out. Those wanting Magic won out against the Movement folks. Here we go. Team B fires up the boiler’s in its tank. 4 Steam, no issues. The Knights charge the small Warrior bunker. The STank rolls an 11” and charges into the side of the big Warrior horde. Otherwise, the Cannon’s crew moves it off the side of the hill while the other Knights charge up the hill to hopefully run down the nasty Shades depending on what they do next turn. The Archers turn to face the Shades to get a few shots off at them, maybe get a Magic missile off on them too, but staying within 12" of the TGM to buff him. The Reiksguard, so far forever pansies in this TDG, move out of the LOS of the Executioners. The ICK charge the Executioners. The Knights charge the Shades and push them off the board. Otherwise, the Engineer moves into a strategic position to hopefully charge down the Execs if they run. The Reiksguard, wanting to get out of the LOS of the Warriors, fails its Leadership test to march within 8” of an enemy. So instead, it does a swift reform (makes the Leadership test) and moves as far away from the Warriors as it can, preparing for an assault by the Hydra. For Team Green, your Comet does not come crashing down, but adds another token. It now has 3. You get a 6 and a 4 for the Winds of Magic. DE channels one, and Team Blue channels one. What is your first spell going to be and how many dice? Voting routine will be as usual. I am unsure.....can´t think straight so I guess team blue has to pick up the ball on this one. Did the Comet come down? or is it going to continue to be fashionably late? Ok... Well let's find out if the comet came down, but either way, I think we're pretty limited to one dice spam each of the six priest buffs (not the flaming attacks against the executioners though). Then 2-dice iceshard on what's left of spearmen unit and then a 3-dice comet that the spearmen would have to move through to engage the reiksguard. Dreadlord's can one dice dispel all of the buffs if he wants to, but will likely roll a 1 or 2 at some point. This could be a big phase for us if we successfully cast 5 or 6 bound spells, with low risk. A second comet could polish off those characters if he leaves the unit or if the first one brings them down to 4 warriors. Or iceshard on that hydra is probably a better option. We actually don't want dreadlord's to panic because we can't chase him down. I havent done any math-hammering on this one, and the order of casting might not be optimal. I thought Wyssan's was casting value 10? If so I say dump the Shield of Faith and use the spare dice on Wyssan's. The rest looks fine to me. We arecasting at +6 on the knights we really need the savage beast...the dreadlord mightbe in contact with the stank so four attacks at 3+2+ that cause d3 wounds each the priest with five a strenght 7 could whack him before that we could also challenge with the gm . Therefore we cant afford a failed cast no two dice but a three dice wyssans on the knights followed by six dice horris savage boosted and two dice anraheir. Hmm, gonna have to hold on until we know wether the comet has come down or not. I´m thinking prayers, HC on the ICK and either Comet or Iceshard Blizzard on the Hydra or the Executioners...but dice will depend very much on the Comet question. I apologize....I had the text for the Comet in the section I was preparing after this, but I should have added it up front of the Magic Phase. I will modify the post. The Comet does not come down. Another token is added to it. The Dreadlord is not in BtB with the STank. Are you going to issue a challenge this turn? The dreadlord still has a champion, so he most properly will accept with him if we get horrors through. Personally, I've had really a lack of luck with miscats so I'm always a bit afraid of too many dices... The risk of failed casting Wyssans with 2 dices is 3/36 = 8%, it really is a small risk, but albeit a risk..
How about we cast wyssans with three, if he tries to dispel it with 2 , we go Fandir's plan of savage (6 dices) followed by curse (2 dices). If he dispels with 3, we use 5 for beast, 2 for curse and 1 for shield. If he lets wyssans go, we use all 8 dices on boosted savage? The TGM killed the Champ last turn. To get Dreadlord to run we need to kill a minimum of 23 spears to get rid of steadfast...provided we don't lose more than 2 models. To ensure this I feel we need wyssans, curse, savage beast and shield of faith. I feel the shield is important as if we lose 3 models we are unlikely to remove steadfast. How many executioners can strike our wiz atm? 3? Though i think it depends on how much danger our wizard faces and how dreadlord dispels stuff as to spell order. A boosted convergence is always useful. How many executioners can strike our wiz atm? 3?. Huss, BSB & FC are in the front row. The Wiz is in the 2nd row. I like to 1-dice prayers early to increase the chances the enemy wizard gets Not Enough Power. I don't think the spearmen will charge the Reiksguard. If they do and make the long charge it would pull their wizards out of the ruins bubble, losing the bonuses for casting, dispelling, and the xtra 100 vp's for most wizard levels within 6 inches of the ruins. They might try it but to net gain appx. 100 vp's after giving up the 100 vp's by moving out and giving it to us if our wiz moves into the bubble, I wouldn't. He would have to make the long charge, win the combat, break the stubborn Reiks, then run them down and they are swiftstride. Blessed be those who game. If he charges the Reiksguard with the spearmen we flee. Even if we fail our leadership check next turn, we won't lose the Reiksguard. Might be nice to know how far the Spears are away from Hydra? 13"? I'd skip the Comet and 2 dice everything. Up to you all on the order of spells. The only unit at risk is the Reiksguard so we should prioritize protecting them. Good luck, cya later, at a meeting today. "...the most incorrigible vice being that of an ignorance which fancies it knows everything..." Camus. If instead he charges the Reiksguard with the Hydra, he's got a chance of holding us in place for a turn, and then can make the decision of whether to charge us with the spearmen or not. We will likely move the ICK into range of the Ruins next turn: that might tilt the bonus points in our favor. Agreed. Yeah in an earlier post (2.5) I mentioned fleeing the spearmen charge, I was responding to posts suggesting to put the comet in front of the spearmen on our magic phase. I don't think we need to, we don't need to prevent them from charging the Reiks if they want to. If the ICK move in we will get the VP's for highest cost unit within the bubble I believe, but the other VP's are for having the highest total of magic levels within the bubble which he controls with a level 2 & 4 in there right now. I'd only reform and move the ICK into the bubble if the Exe's need snake eyes to rally, provided we win the combat and they break. Otherwise I'd go for chasing them down if they would be able to rally as normal on their turn 6. I think that we need to be throwing more dice at these spells than less. The more dice we throw at the first spell will be more likely to draw out more DD. That would increase our chances to get savage beast off. Our magic phase really hasen't had much of an effect this game and I would really like to see somethinghappen here. We need a good chance of killing the dreadlord, i dont see that for the warrior priest , 5 attacks are not that likely to do 3 wounds when at 4+ to hit.